Of course I had to make a fun portrait of my cat. It was a free time project and it took some time to finish it. I pretty much already knew how drawing would look like and I didn't spend too much time on drafting and developing the idea... The only thing was - I had totally forgotten how to work with charcoal (facepalm)... To be fair there was a bit of struggles at the beginning, I didn't even know how to start. But by the end of work I remembered everything I needed to make this portrait the way it is now. 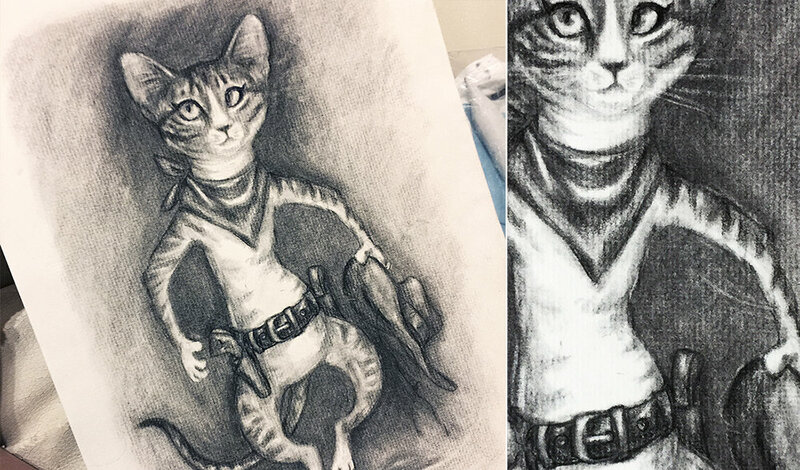 BTW I highly recommend kneaded eraser for any type of drawings, not just for highlighting fur and whiskers on a charcoal cat face! :) I tried it quite few years ago and never stopped using it since then. If you don't like those crumbs and mess that regular eraser creates all over your drawing, draft, sketch, then you will LOVE kneaded eraser.